"Back pain": Two small words that cover a wide range of conditions and symptoms. We have expertise in treating all forms of back problems, from postural imbalance to rehabilitation after complex spinal surgery and work closely with leading spinal specialists. We strongly believe in the importance of treatment tailored to your specific situation, not generalised exercise programmes. No elaborate exercises either, just functional exercises that relate directly to your daily and/or sports activities. Only then will you optimise your recovery and in the long-term keep your back healthy. Make time and be motivated to do the exercises (in the gym, at home or both). It is important to make them a priority in your working day. Working to improve your back function is a journey, not a quick fix; for most of us it is a necessity, not a luxury, which should be integrated into our daily lives. Don't wait until your back screams it is time to do something. Prevention now, is better than acute pain later. We will take a detailed account of your back problem, from symptom patterns to medication and workstation ergonomics. Your posture, spinal stability and flexibility will be tested along with postural and core stability, and the mobility and flexibility of your arms and legs. Dynamic stability and balance in upper and lower limbs will also be evaluated. We do specific neurological tests where indicated. All these findings combined will give us a detailed insight and provide the basis for your treatment strategy. Back care often combines self-help exercises and ergonomic advice, with hands-on treatment and a core/postural stability rehabilitation programme. We set clear short and long-term goals in discussion with you and your specialist. We see many patients who have sought to improve core stability with Pilates (reformer) exercises and classes. We often find that patients don't engage their core stability muscles correctly, even though they are exercising at a high level of performance, so there is still work to be done. Treatment in the case of acute pain is initially aimed at reducing the pain and restoring normal movement/flexibility. This then provides the opportunity to improve your core/postural stability, which helps to significantly reduce any future back problems. We believe that you should not exercise through acute pain, unless you can perform the exercises correctly without adverse reaction. So, correct form, always comes first. Hands-on techniques including joint and soft tissue mobilisation, manipulation, massage, stretches and PNF. This will be used to improve joint movement and reduce tightness in muscles, tendons and scar tissue. To keep your spine in a healthy condition you need to maintain movement within all joints, flexibility in your muscles, and be able to support your spine well during movement and static positions. Sitting or standing (static loading) is particularly demanding for the spine. To address chronic back problems, you need to be practical and regularly perform your exercises and stretches. Moving is good, so get up! We first perform a detailed assessment of any movement restrictions (joint or muscle stiffness), evaluate your spinal and core stability (posture) and identify any other contributing factors to any spinal dysfunction. 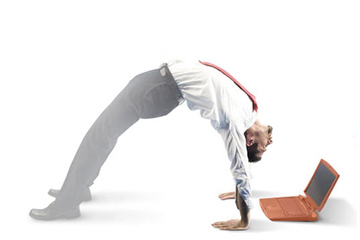 We perform a functional movement assessment and discuss your desk set-up and demands at work. Only then can a programme to improve your spinal function commence. After a detailed assessment, instructions for tailored exercises will be given and the physiotherapist will check that you can do them correctly. It is important to do your homework and make sure you do your exercises correctly. Postural compensations or incorrectly performing the exercises may not get you the result you want. We provide programmes for acute and chronic problems and help establish a long-term exercise routine to help prevent future troubles. Working to improve your back function is a journey, not a quick fix. And for most of us actively maintaining a healthy spine is not a luxury. Don't wait until your back screams it is time to do something. We will provide tailored functional exercises during your recovery of acute injuries and help integrate specific spinal exercises into your exercise routines for long term benefits. We teach you how to do exercises correctly, avoiding common mistakes (overloading, compensations) and will contact your personal trainer, Pilates or yoga teacher to provide them with our recommendations. Most patients will have reached the stage of intervention when acute symptoms persist despite treatment. Injections aim to provide a pain-reduced and function-improved window to progress physiotherapy, helping to restore spinal movement and postural stability. We work closely with your specialist to tailor treatment to you and, together, we work intensively towards your recovery. Epidural and facet joint injections are the most common injections. Surgery is often the last option after treatment and injections have failed. A graded, tailored rehabilitation programme will take you through the recovery stages. Fusion and discectomy are the most common surgical cases we see.